When the weather gets colder and the leaves have fallen off the vine, the grower gets a chance to take a nice slow, deep breath. Another season is in the books and the vines are not susceptible to the diseases that we scouted for over the last 7 months or so. We get the chance to evaluate the process, the quality of the vintage and the vines themselves. Over the past few years, there has been a lot of die back in the vines. 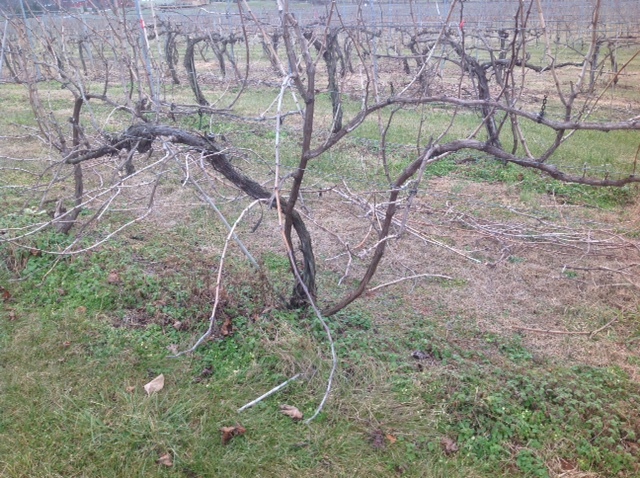 We have been able to train up some new shoots from the base in order to rebuild the structure of the vine. There are a number of metaphors that I can tie to this process. Man has been training grapevines for thousands of years in order to get a productive and flavorful harvest. Mother Nature continues to challenge us with changes that we learn to dance through. Specifically, we will cut away older, low productive sections of a vine and train up new shoots to a position where the fruit will be protected and managed in our system. This process is slow and thoughtful. An inexperienced pruner will always leave many trunks as a “just in case.” An experienced pruner knows that too many trunks will lead to a crowded and confusing canopy that will be very inefficient to tame during the growing season. None of this is easy, but making the right cuts along the way will prove fruitful in the end. Many folks think that the winter time at a winery is for resting. The cellar is always working on some level. Our bottling schedule is batch based. When the bottling truck comes here in February, we will have 7 wines to bottle. In April, we will do it again with another 8 wines. We also have apple ciders to ferment and bottle with the other bottling line. That will happen in January. We are also working with a number of clients to make wines, train staff and upgrade their vineyards. This is an activity that many other operations don’t do, but we continue to try and help the industry grow in quality and stature by consulting. And we make a job or two by doing this. The tasting rooms are a great place to visit in the winter, especially if they have some indoor space for chilling and warming. Many will have extra food offerings, special events and different tasting experiences in order to attract customers. It is the time where visitors can get a little extra attention because the crowds are less. I always feel I see my best customers in the winter because they have learned this aspect of the business. I am always impressed with the fact that when we have a big snowstorm, we get a number of visitors coming out virtually right behind the snow plows. Many are the adventurous ones enjoying the snow and others just need to get out of the house. We have learned to shovel, clear and warm ahead of the rush. So as the New Year begins, we may adjust and rethink, but we continue to work through. The opportunities to renew and refresh are there. We continue to keep our staff employed and our home fires burning. Enjoy this time of year as those needy green solar panels will show up on the vines sooner than you know it.